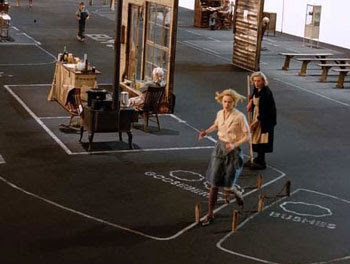 Dogville is a distinctive coalition of theatre, film and visualized literature. The entire film is minimally shot on a single stage where houses, streets, bushes, and even dogs are marked only by white chalk lines. There exist no walls, no doors, although the actors open and close invisible doors with accompanying sound effects, and there is blankness, mostly - physically and metaphorically. The camera passes through all homes, welcome and unwelcome, and thus allows von Trier to eliminate the distinctions between public and private, inside and outside.The distinction lies only in "Us" and "Them". It is an unusually brave attempt to bring the idiosyncrasies of theatre and amenability of a film together. Von Trier also hosts a form of narrative literature that is at variance with the usual treatment of a film. The entire film is divided into nine chapters and a prologue, including title cards for each chapter which announce the events of the following chapter. The linear plot is afforded a voiceover by John Hurt’s omniscient, cynical, sarcastic, and sometimes critical narration. 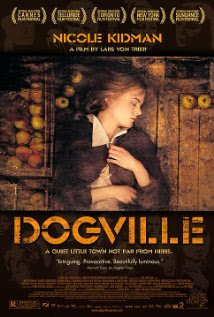 The prologue opens in typical fairytale style: “This is the sad tale of the township of Dogville”. At the outset, the narration makes it clear that this is a fairytale – with a lesson to be learnt. A lesson that turns all mirrors to oneself and forces a cruel moral scrutiny.